Jeppe’s First Aid and Emergency Medical Care department started in 1986 by Mr Chris Hart and Mr Andrew Gill, and began as a subsidiary of the St John Ambulance Brigade’s 21st Transport Division, and is arguably one of the most active Cultural/Services within the school. Boys participate in First Aid activities Monday to Sunday, during school, at Hostel and on the sports fields the whole year round. Be it on the side of a Hockey or Rugby Field, or manning a first aid post at local community events. Jeppe First Aid Old Boys range from very prominent Advanced Life Support Paramedics, to Physiotherapists, Pharmacists, and Medical Doctors, all taking their first steps into the medical world as first aiders. Our First Aiders are trained in Occupational Health and Safety First Aid Levels 1-3, as well as holding further additional competencies in IRB Rugby First Aid Certification. This strong, dedicated team of individuals are put to the test on a daily basis, dealing with injuries ranging from minor cuts and bruises, to more severe fractures and Spinal Injuries, both on the sports fields, in the Hostels and during the day-to-day activities of the school. 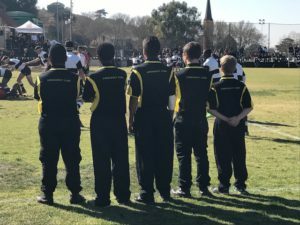 Jeppe’s Senior First Aid Teams are currently unmatched at the annual Inter-High First Aid competition, and have won the prestigious Regional Event since 2013. In the Novice and Junior rounds, they have always placed in the top 3 positions. 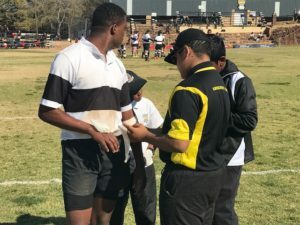 The Jeppe First Aiders regularly work alongside with Quick Response Service Paramedics at the Rugby, and are an invaluable service to both the Boys, and visitors to the school. We have renewed our long-term partnership with both the Jeppe High School for Girls First Aid team, as well as assisting in the introduction and start-up of a First Aid team at the Jeppe High Preparatory school. This allows them to be trained in basic first aid, and helps integrate them into the First Aid teams when they move to Grade 8. Not only do we provide First Aid for schooling events, but we are available to assist the community with their medical needs as well. We currently man a first aid post at The Sylvia’s Market on Sundays, provide first aid support to Orchards Primary School, as well as at the Annual Kensington Rhodes Park Spring Fair. A few of our first aiders also volunteer their time on holidays and weekends to ride along with local paramedics to gain experience and jump start their careers in the medical field.